The University Club, nestled near HP and Xerox PARC off Foothill Expressway in Palo Alto, was an ideal location for such an event, providing safe and ample space for approx. 150 guests. 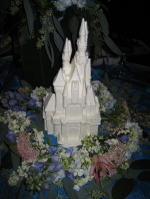 The event included a full buffet, soda fountain, desserts galore (including a white chocolate castle) and frost-your-own cookie kits. The children's buffet was on a lower table for ease of access by them and included mini Mickey noodles, chicken fingers, apple sauce and organic apple juice bags. For parents, it's impressive the amount of thought and planning that went into the kids enjoying themselves. Other activities included a Mickey Mouse Mr. Potatohead part station where children could build their own box of parts - my daughter brought hers home and played with it the rest of the night. There were also drawing supplies - crayons and markers and coloring pages with various Disney themes. All of the kids had ample time to spend with their favorite live characters and the stage was large enough for little ones to do some dancing. 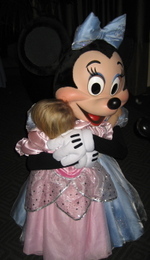 Special thanks to Minnie and Mickey for the extra attention my little one received. As the decorations came down and nearly everyone was gone, she still wanted to dance the night away. Thanks Disney for bringing the party to us. We had a blast too!